This weekend was the annual Bond Brook Tread Fest trail running and mountain biking festival in central Maine with a number of trail races for kids and adults. The 5-miler I ran also doubled as the 2014 USA Track and Field state trail championship, which was kind of neat. I thought it would be fun to say I went to States. It also meant that since I signed up as a USATF member my USATF age group win made me a Maine State Champion. (USATF State Champions are done by age group, not overall. I was third female overall in the race.) Confused yet? It simply means I got a nifty patch and medal. Plus, a pint glass and Clif protein bar for my winnings! How long can you request that your family members refer to you as The Champ? I'm pretty sure that 24 hours in we've already passed that point. Any championship that comes with a pint glass is worth winning though something stouter than a protein bar would fill it better. Congratulations! I think "champ" isn't sufficiently honorary. You should insist on "Her Majesty - the Champion!" along with a little bow. As well as some horns to announce every time you enter a room! You look cold. We're still wearing t-shirts here in Illinois. In all seriousness, I'm actually a pretty average trail runner, but apparently winning your age group at the USATF state championship race (even a small one) is good enough for a win. Logic compels me to point out that I am not the only State Champion, as there were a few other age group winners. I think it's kind of funny overall and fully embrace it. Yes, it was fairly cold out (in the low 40s) for the race. Lots of layering in action before, during, and after. As for the Clif bar, I think it's already been eaten by one of my kids. 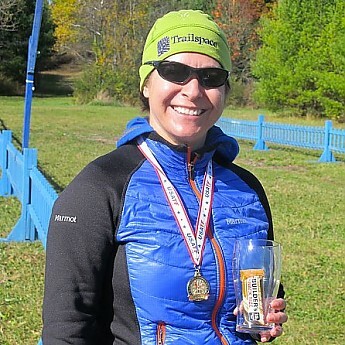 Racers do get a free beer at this event, this time from new brewery Tumbledown Brewing (take note, fellow Mainers). I had the stout. Congrats on the win. Now on to Nationals, Alicia! haha. In the late 60's, as a 12 year-old, my dad ran at an event sponsored by USATF's predecessor in his little hometown in PA (why they were even holding the event in such a small town, I'm not entirely sure). He won his age bracket and the officials then checked his winning time against all other recorded 12-year olds that year, and declared him the World's Fastest 12-Year Old in the 40-Yard Dash (pretty bold claim for an organization with only a national reach). I'm sure he was the talk of the town for a day, but looking back he finds it rather comical. I still have his little trophy (of course, when trophies were metal, not plastic), his three-stripe blue and white Adidas he wore that day, and the annual booklet of records that he was sent later that year that "officially" declared him the fastest 12-year old. Sounds like USATF has a history of handing out a lot of medals/trophies. That's an excellent story on your world-record setting dad! Congrats Champ! It's great to see so many other awesome women runners out there. Keep it up! I became a runner in following after my mom, who didn't start running until her late 30's. She did the Pikes Peak half marathon a few times and I have yet to do anything near as great as that. To be honest, I kind of hated running cross country and track in high school, since it was something she pushed me to do. But I stuck with it, made it my own sport, and it's been at the core of everything else I do for the past 20 years. I try not to race much, because then it feels too much like high school. But I enjoy the occasional local 5k and feeling special when I place in my age group. After all the training you put in (just for the love of doing it), it's still nice to get rewarded. So enjoy it. I think you've done plenty of great things already! Your point about being pushed into running is a good one. I'm trying to walk that line of encouraging my kids to run, bike, ski, etc and have a love of being active outdoors (which they do), but also not to push them so they end up hating or rebelling against it. I'm proud when they run or bike in a race and ski expert runs, but I have to remember that the goal is for them to enjoy it and keep wanting to do that activity. And that it will be their own sport, not mine. I think having running as a base makes everything else I like to do better. 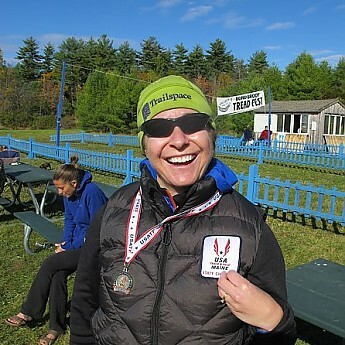 This forum: Older: Trailspace on the AT Newer: Reppin' Trailspace!